We are a group of scientists interested in how Nature works– from understanding the role of the capillary wave propagation at the water surface in insect communication to the biochemical reconfiguration of a leaf after being fed upon by a herbivore- in an ecological and evolutionary context. While firmly positioned in fundamental science, we also strive for balancing our activities between advancing the knowledge front and participating in tackling some of the most pressing questions of our planet- from dissecting the ecosystem services provided by conservation biological control to the evaluation of thermal performance of arthropods under varying climatic scenario. We describe this work as implied science, following L. Pasteur. He refused the term applied science, but was willing to study fundamental questions using organisms and problems of high relevance to human society. We work mainly at the organismal level, but we also deal with processes at the cellular level and also on population and community ecology of consumer-resource interactions. All topics are approached in a highly integrative and broadly defined fashion, and span at least two spatial or temporal scales of inquiries. The choice of topics and arthropod species is eclectic on purpose, as common principles eventually emerge after a long maturation with each subject. Our backgrounds reflect this diversity: biologists, mathematicians and engineers. (i) Nutrient acquisition and allocation in relation to the reproductive physiology of parasitic wasps. (ii) Biochemical and hormonal interplay in intimate insect-plant relationships such as leafminers. (iii) Reversible colour mimetism in spiders and its neuroethological and biochemical basis. (iv) The cascading effect of an herbivore invasion on the population dynamics of its parasitoids and their other hosts. (v) The solid and fluid mechanics of insect life. (vi) Biomimetics, through the design of flow sensing MEMS (micro electronic mechanical sensors). (vii) Agroecology, through the understanding and use of multitrophic interactions in agroforestry systems. 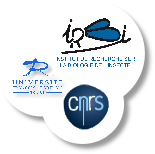 At the Institute of Research on Insect Biology we are organized in two interconnected research groups within the Ecology of Multitrophic Systems and Biomimetism research team led by prof. C. SUPPO.